It took only a few hours for the first Argentine aircraft to appear over the beachhead. At 08451 an MB-339 armed trainer making a circuit of the island from Port Stanley passed through the narrows at the north end of Falkland Sound. The pilot attacked the frigate Argonaut, wounding two men, then turned and flew up the valley towards Port San Carlos, directly over the invasion fleet. The fleet below opened fire with everything from machine guns to Seacat missiles, but he escaped undamaged to Port Stanley and delivered his report. Another early recon sortie, by a Pucara light attack aircraft from Goose Green, ended when it met a Stinger missile fired by an SAS team. The pilot ejected safely and walked back to Goose Green. To provide a first line of defense against the inevitable air attacks, the British planned to use the Harriers aboard Invincible and Hermes. Unfortunately, they were seriously handicapped in this role by a variety of factors. The biggest was the lack of any sort of airborne early warning, which would have allowed them to spot raids early on and vector the Harriers onto them. The radar on the Harriers was not adequate to see low-flying targets overland, which the terrain hid from the electronic eyes of the escorts. As it was, the Combat Air Patrol (CAP) could only be kept on station for about 10 minutes before it had to return to the carriers, and there were only enough aircraft to put a new pair up every 30 minutes. A decent AWACS capability might have let the carriers move in closer, but they had to be held far to the east of the islands for fear of another Exocet attack. The first real attack came from a flight of three Daggers that appeared low over West Falkland at 0935. They went after the warships in Falkland Sound instead of the transports inside San Carlos Water, attacking with 30mm cannon and 1,000 lb bombs. One was shot down almost immediately by a Sea Wolf from Broadsword, although that ship suffered 29 cannon hits from another Dagger, wounding 14 men and damaging two helicopters. The third aircraft went after Antrim, scoring the first bomb hit of the campaign. It entered the stern of the destroyer, passed through a pyrotechnic locker and the magazine for her Seaslug missiles, just missing a pair of live weapons, and then lodged without exploding in the head. This caused "some concern" to the man who was relieving himself, but no casualties. In fact, this would be a recurring pattern throughout the Argentine air attacks. By attacking at extremely low level, they were able to avoid the worst of the British air defenses, but in doing so, they did not give their bombs enough time to arm before impact.3 If they had been willing to fly slightly higher and take greater casualties, they would have had much more success in actually doing damage. Another trio of Daggers swept down on the ships in Falkland Sound 10 minutes later, as Antrim was seeking sheltered waters where she could repair her damage. She fired one of her massive Seaslug SAMs at the incoming aircraft purely by eye, primarily to get it out of the way of any more damage but also to try to distract the attackers.4 It didn't work all that well, and one of the Daggers peppered her with cannon rounds, wounding 8 men and damaging her faithful Wessex 3. The other two flashed past Ardent and turned for home, followed by a pair of Harriers. Unfortunately, they were too far back, and although one of the British pilots fired a Sidewinder after them, its motor ran out some way short of the target. 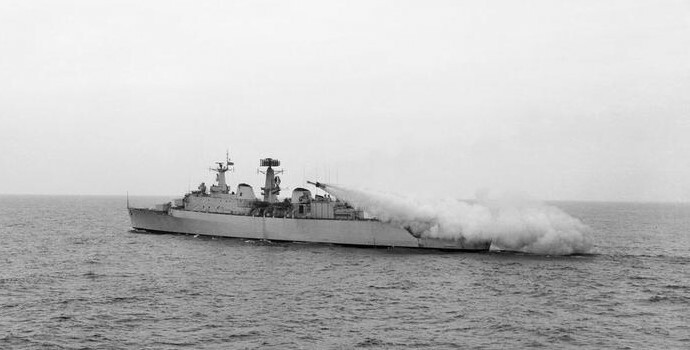 An hour later, a pair of Pucaras from Goose Green attacked Ardent, steaming north from her position in support of the diversionary SAS attack on Goose Green. They were quickly driven off by her 4.5" gun and Seacat missiles, but returned 15 minutes later to try again. 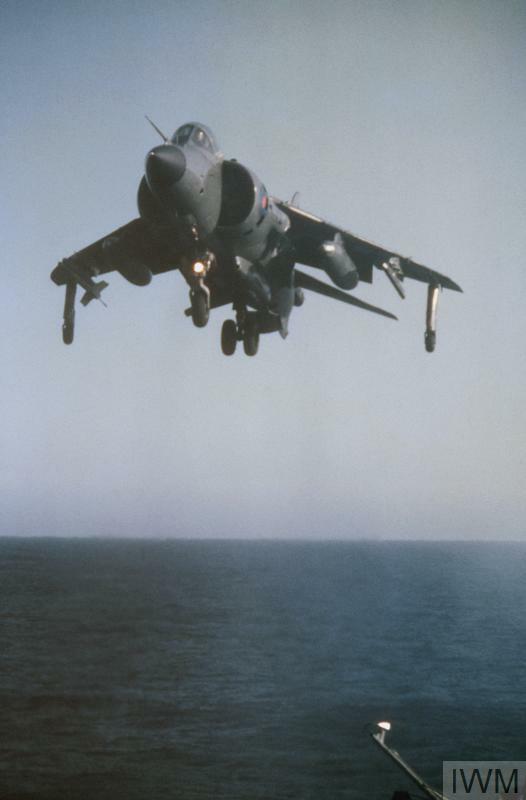 That time, they were greeted by a trio of Harriers from the CAP, which engaged with 30mm cannon. The first three passes were unsuccessful, but on his second attack, Lieutenant-Commander "Sharkey" Ward set his target's starboard engine on fire, then got the port engine on his third pass. The Pucara's pilot ejected and walked back to base. The next aircraft arrived over the islands around noon. The flight of four Skyhawks had already run into trouble, with two aircraft having to abort with technical problems, and the other two planes first encountered the freighter Rio Carcarana, derelict after air attack 5 days previously. The lead pilot realized just in time that it wasn't a worthwhile target, but his wingman dropped his bombs on it. The lead continued on, encountering Ardent in the Sound. He was within 2 miles before the frigate's crew spotted him, and his bombs straddled her while her crew was only able to reply with a few rounds from the 20mm cannons mounted to the railings. 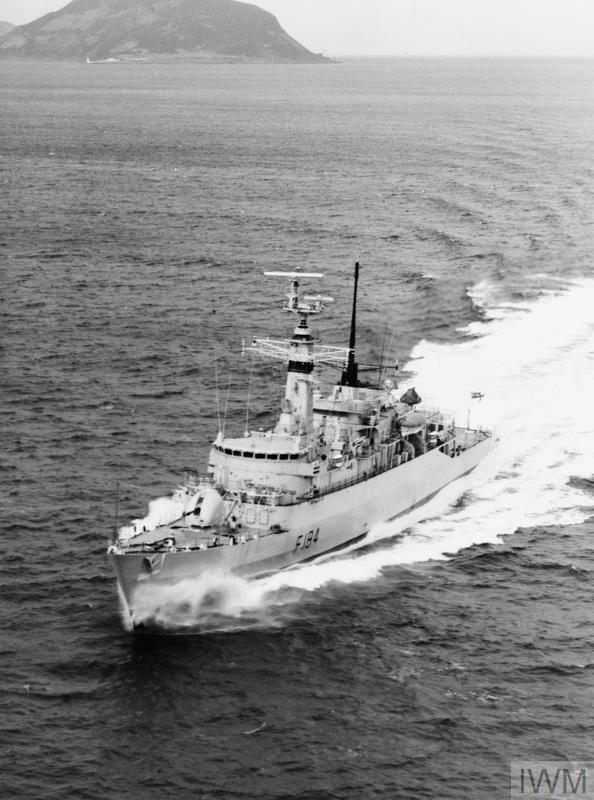 The low-flying jet then flashed over the frigate, knocking the main air-search radar out of alignment with its wake. A pair of Harriers just arriving on their CAP station were vectored out after the fleeing Skyhawks, but one of their pilots spotted four more of the little jets inbound, and they swiftly broke in pursuit. Each British jet launched a Sidewinder, blotting two A-4s out of the sky, along with their pilots. The other two jettisoned their bombs and got away cleanly. This interception kept the skies quiet for the next hour and a half, a respite the British used to move 42 Commando, previously held in reserve, ashore from Canberra. But the day was far from over, and we'll examine the afternoon attacks next time. ...The Argentines did have MK15 Snakeye fins for their Mk82 bombs- these look like trash cans bolted to the base which open up into four sections that do an amazing job of slowing the beast down - and they definitely used them. However, they didn't have many, and it later turned out that the Argentine pilots were coming in so low that many fuzes didn't have the time to arm at all - most of what they used were US Mk82s, and IIRC they only had M904 mechanical nose fuzes for them, which rely on a spinning vane to arm. I know they had some, although it wasn't entirely clear from my sources why they didn't use more. I should have expected that you would know, and the thing about the fuzes makes sense, too. To be fair, I think the Argentines were mostly concerned with not losing all their aircraft in the face of an air defense system of unknown effectiveness. I can't blame them, there is a good chance that a more aggressive, higher altitude attack pattern could have resulted in a loss of all aircraft and still not have achieved much. The one thing I think we could fault them for is the sort of piecemeal attack plan, where they trickle in little groups of fighters in uncoordinated attacks with seemingly little purpose. Is that the result of them not having any intelligence on the location of the British, so just sending small flights out to wander around looking for something to attack? Re choice of attack altitude, higher terminal attacks wouldn't have increased vulnerability that much. Throughout the whole of May 21s, they lost only one airplane to SAMs. Harriers accounted for everything else, and altitude during the last 30 seconds of the attack changes nothing for them. I'd guess it was mostly that the pilots weren't trained for this kind of attack, which requires a fair bit of care to make sure you're as low as possible without being so low that you have fuze problems. The other issue is that they didn't change much later on. Attacks over the next week saw pretty much the same pattern, including the high proportion of duds. As for the attack plan, there are a couple of things there. First, putting multiple independent formations of aircraft over the target at the exact same time is a bad idea. Yes, it dilutes the defenses, but it also makes the chances of a mid-air way too high. You'd want to stagger them slightly, which is still going to saturate the Harriers and dilute the other defenses. But that sort of careful coordination requires really good staff work, and that's something that sets first-rate militaries apart. The British could do it. The Argentinians? Not so much. Particularly given that the fighters were from several different units and spread across multiple bases. There might have been other limitations, too. IIRC, the A-4s had to tank to get to the Falklands, and Argentina only had a couple of tankers. Just a couple of picky little points, which I hesitate to bring up except that this is a great summary that could be used as a resource for years. 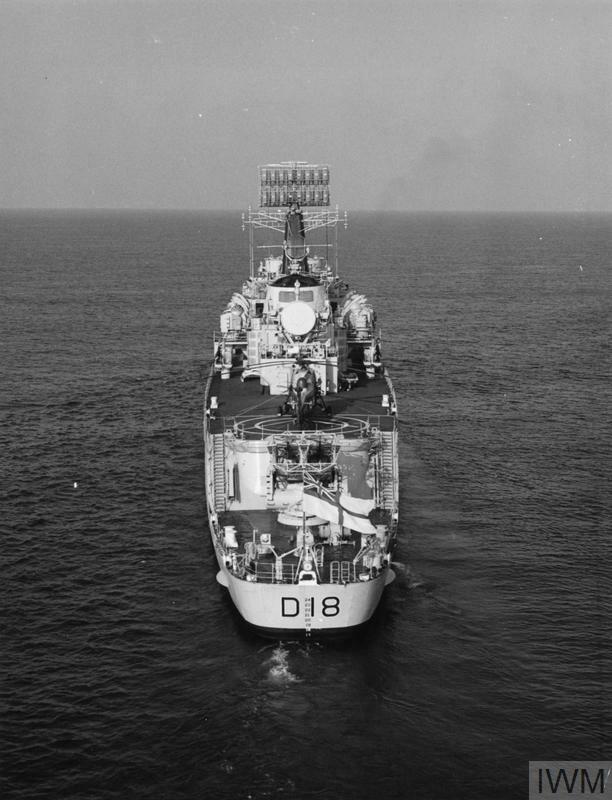 - I had to go and search to find that HMA Antrim was a Destroyer (5400 t displacement). Yes I know you listed it earlier but it was a LOT earlier and it's sort of relevant to picturing the battle to know what sort of ship it is. Even "destroyer" isn't quite enough as we have a bunch of ships involved from several decades of military tech and the size of a destroyer has grown a fair bit. 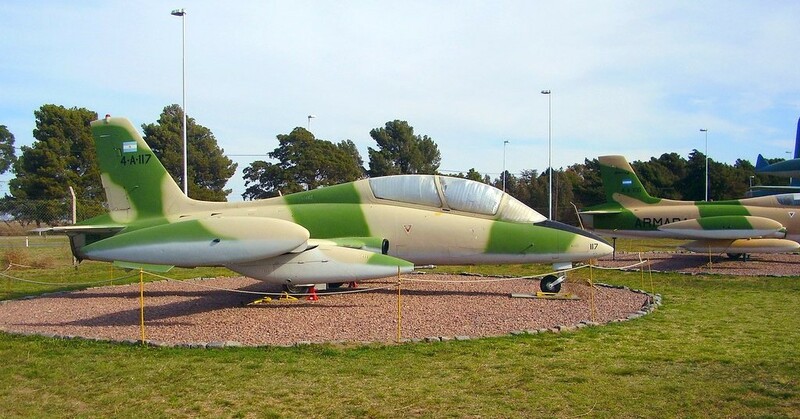 -Likewise the Pucara aircraft. - So Rio Carcarana was an Argentine ship that was bombed by both the British AND the Argentinians? I try to solve this by linking to wiki, but I sometimes forget to do that. My fiancee got confused when proofreading this and thought the Harrier was a ship. And yes, Rio Carcarana was bombed by both sides. "My fiancee got confused when proofreading this and thought the Harrier was a ship." Are you still going to marry her? I think I'm going to try to solve the linking problem by writing a glossary. I can easily include the wiki link for each ship/airplane/weapon/whatever, along with a couple sentences on it, and just link to the whole thing from the "previously on" paragraph.